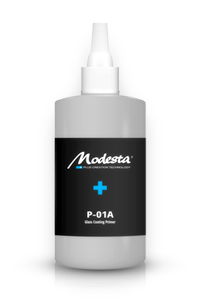 P-01A is a highly advanced unique primer used for Modesta liquid glass coatings. It contains a blend of high quality resins and additives capable of producing up to 10 microns on top of the paint. 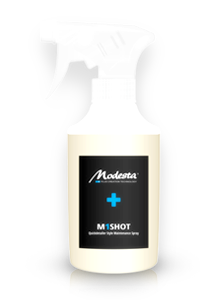 It can also be used as a finishing polish adding gloss and depth to the paint. 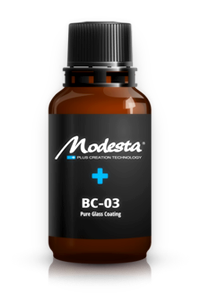 Extremly durable, hard pure glass coating that reflects light with specific wavelengths, producing an instant luminous shine and gloss. 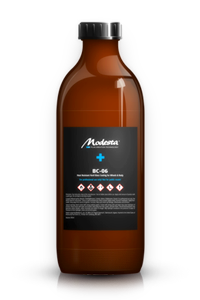 Contains photocatalyzing agents that produce active oxygen when exposed to UV rays thus preventing the attachment of contaminants. A new formula coating that combines the best advantages of the original Pure Liquid Glass coatings and highest quality nano-grade titanium. This combination creates a deeper shine and better reflections on the paint. A significantly prolonged working time also allows easier and safer application. The Modesta Flagship. Based on a three-dimensional molecular frame it forms a highly durable clear glass coat on the paint and produces an unique "candy-like" gloss. Other qualities include strong water-repelling effects, durability of up to 10 years and outstanding protection against all kinds of contamination and oxidation. Creating a hard glass coating with a tightly packed molecular structure that creates a long-lasting surface. BC-06 is applied with a spray gun and is heatproof up to 1,300°C – enough to protect wheels from burning-hot brake dust.